The stage was set at The Book Lounge, chairs were laid out, canapés were being prepared. While copies of Finding Soutbek were being put onto the system we were mightily impressed with this welcoming and well stocked independent book shop in the heart of Cape Town. Then guests began to arrive, quite a lot of them, more chairs had to be roped in, actually they were even sitting on the steps. Rustum Kozain gave a thought provoking and wonderful introduction to Finding Soutbek: ‘this is a remarkable novel, and it is the debut of a writer to be watched’, before urging the audience to buy a copy and read it that very evening. He and author Karen Jennings gave lovely readings followed by a lively questions & answers session. 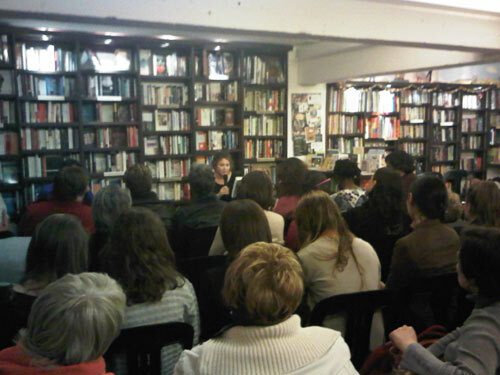 After this, copies of Finding Soutbek went like hot cakes, and at the end of the evening they were sold out. 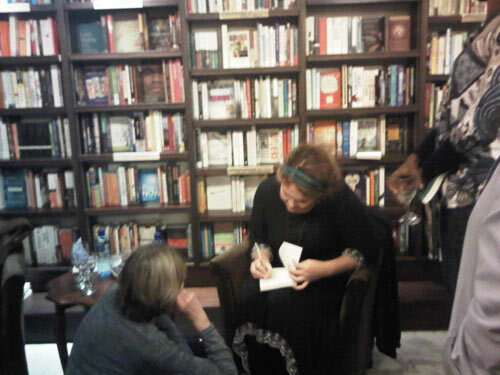 So Karen was kept extremely busy signing her novel. Everyone had a great time at this fantastic evening which launched a book that puts the Rainbow Nation on the spot in literature. Special thanks to Johan and his Book Lounge team for organising such a successful event. You can buy Finding Soutbek now in print and ebook formats.